Toast to your relaxing mountain vacay with a glass of red wine or bubbly champagne after a nice soak in the outdoor hot tub at Smoky View on the Rocks! 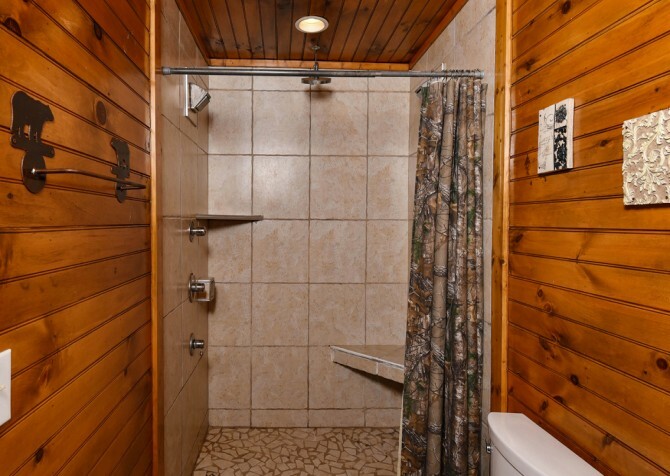 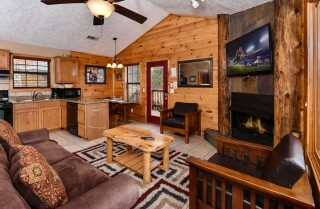 This secluded, 2-bedroom, 2-bathroom cabin lies close to downtown attractions and boasts comforting amenities for all to enjoy. 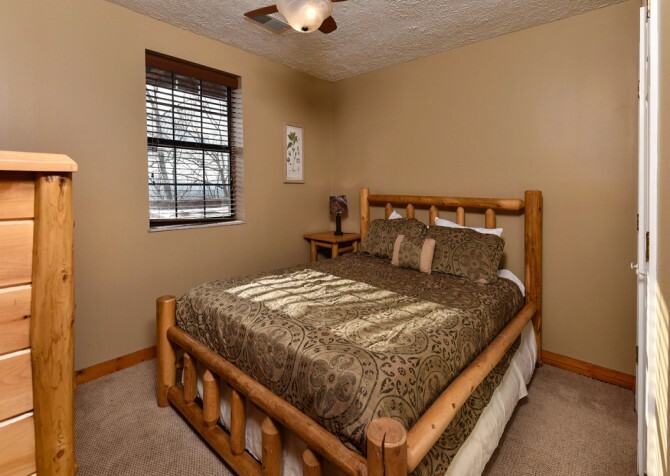 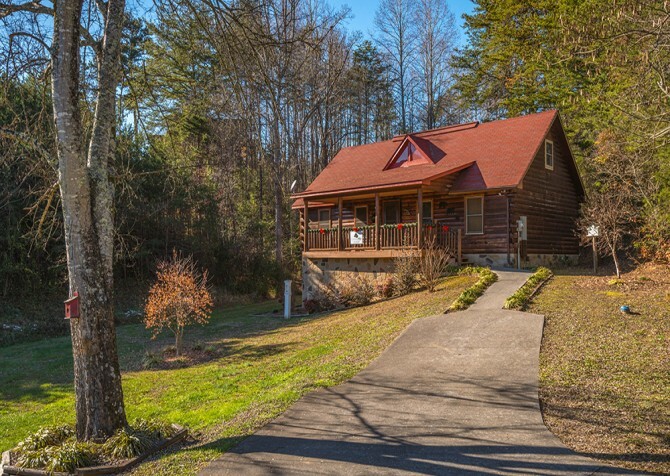 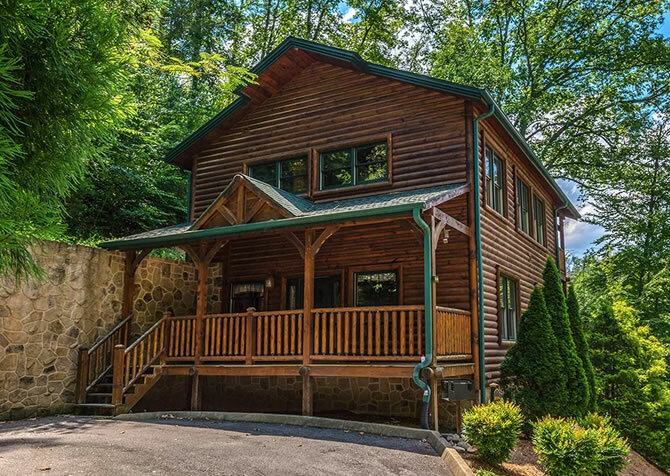 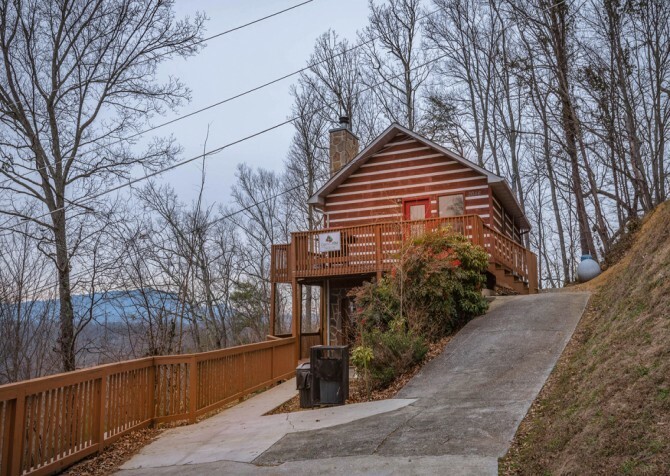 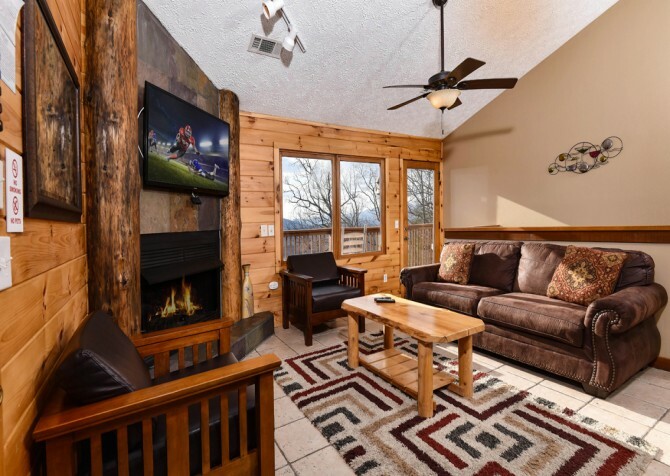 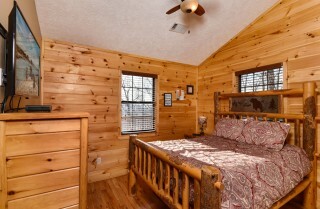 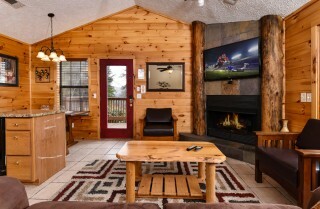 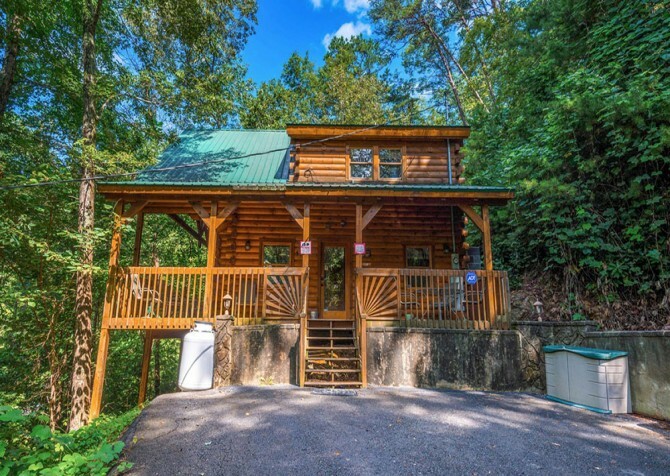 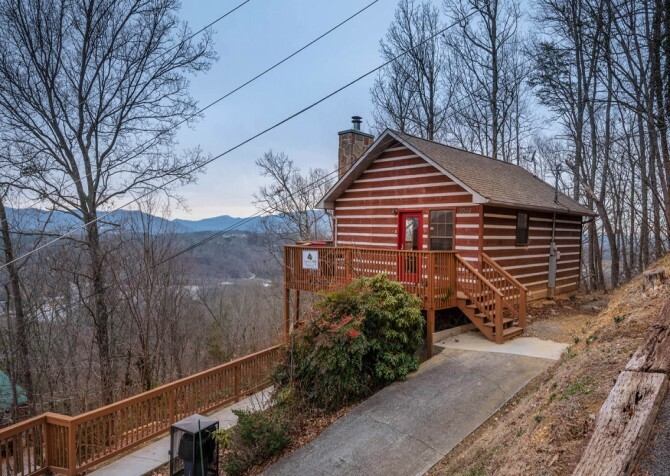 From waking up to majestic mountain views and dining on the back deck to cuddling up by a warm fire and watching a romance on the big screen TV, endless smiles will come naturally at this Pigeon Forge abode. Enter the home to find a welcoming living space with a big screen TV, a gas fireplace bordered by beautiful log pillars, 2 sitting chairs, and a sleeper sofa. 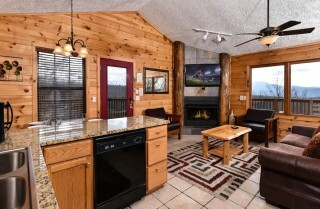 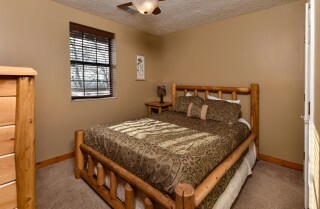 Take in the Smoky Mountain views from the large windows while your little one crawls around on the plush area rug. Let the kids stay up for movie night with a family-size bowl of popcorn and sweet treats galore on the wooden coffee table. While the youngsters hang out in the rec room downstairs, roll out the sleeper sofa to snuggle up with your spouse for a film classic on the big screen. Flip on the ceiling fan to keep cool in warmer months or get a fire going to create the perfect ambiance for a good evening read. Before heading out on a Pigeon Forge adventure, check your makeup and hair one last time in the wall mirror right by the front door — convenience at its best! With glorious mountain views streaming in from the living room, spending time in the fully equipped kitchen will be an enjoyable experience. 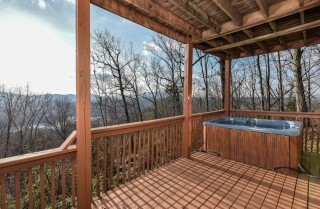 Plus, there’s a good-size window over the stainless-steel double sink, letting in even more natural light! 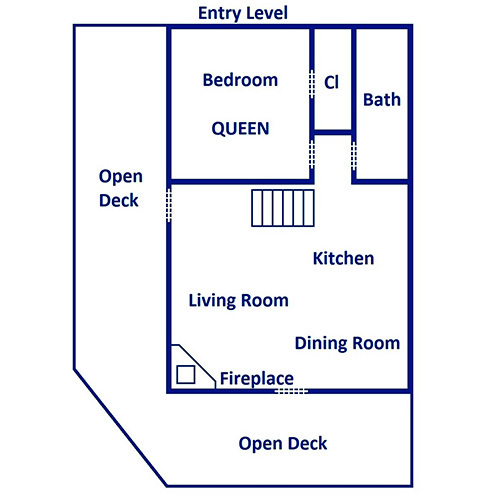 Bake birthday cakes in the oven, prepare family meals on the stove, keep restaurant leftovers in the fridge, whip up breakfast smoothies in the blender, ready afternoon bagels in the toaster, brew a fresh blend in the coffeemaker, and pop a theater classic in the microwave. Don’t worry; the hard-working dishwasher will be there to make cleanup a breeze. 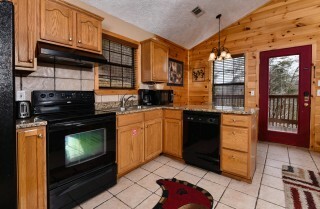 However, if you’re not really in the mood for cooking, send out for pizza instead — it’s your vacation; you decide! 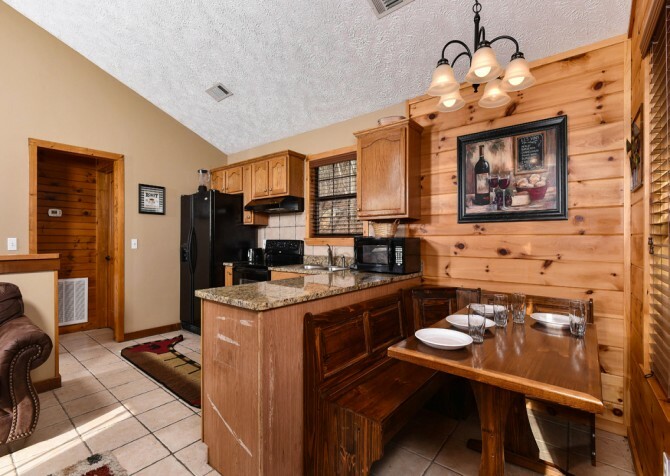 Though, we do highly recommend at least taking a moment to appreciate the adorableness of the kitchen rug — which is shaped like a vintage canoe! Lay out your meal of choice on the spacious kitchen countertop near the dining area to keep second helpings within reach as you dine at the restaurant-style table. 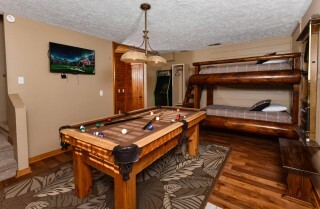 Have the kids take turns sitting in the corner seat or steal it for yourself! 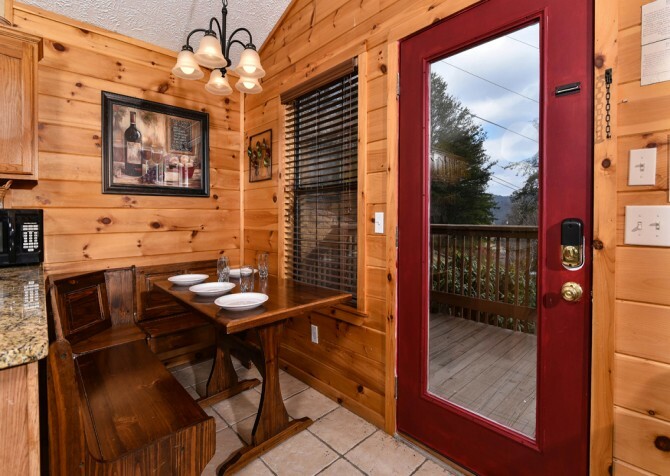 With a wine painting nearby, dinnertime is the perfect time to bring out your Mountain Valley Winery bottle of vino for a toast to your mountain vacay. 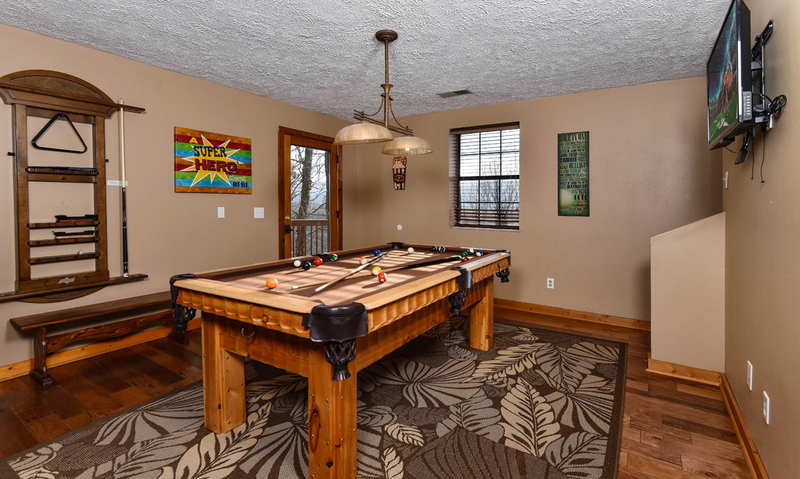 After dinner, clear the table for a card game or make it an art space where you can put your artistic side at ease — after all, with new experiences comes fresh inspiration! 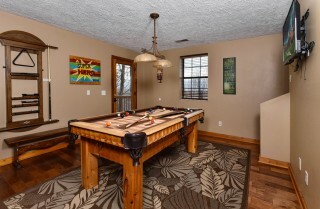 Head downstairs to the rec room for a playful evening. 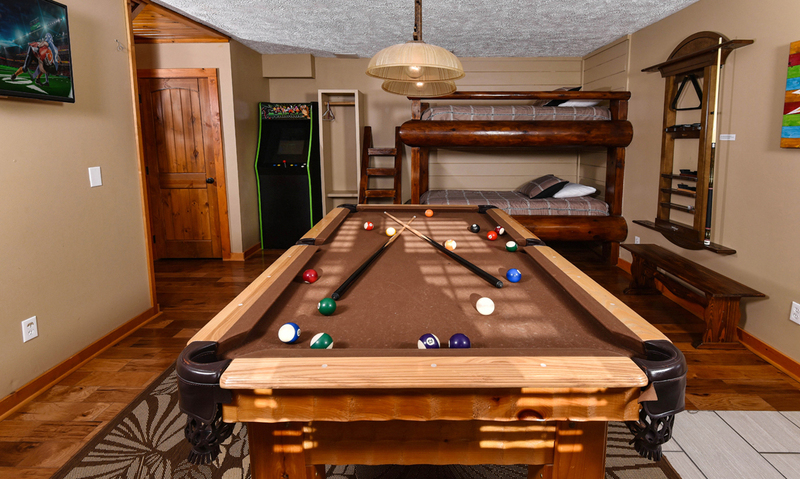 Cheer for your besties as they beat the high score on the arcade unit and receive applause yourself after taking out the family pool champion! 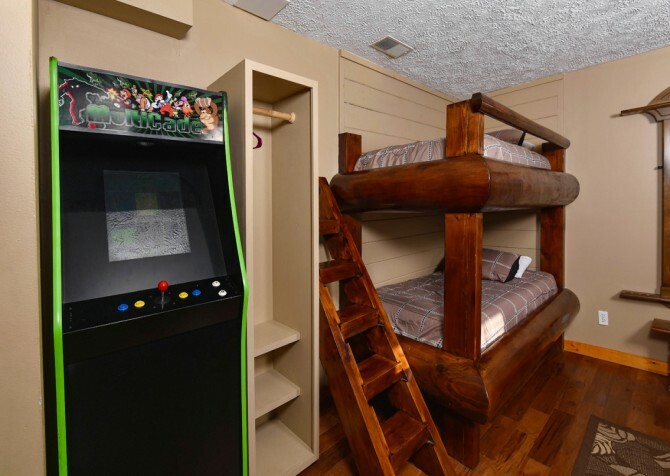 Watch the big game on the mounted flatscreen TV from the comfort of the twin bunkbed or have a seat on the wooden bench while waiting for the next round of pool. Each boasting a queen-size bed, flatscreen TV, ceiling fan, and wooded views, the 2 cozy bedrooms in this home (one on the entry level and another on the lower level) will make the journey to dreamland a comfortable one. 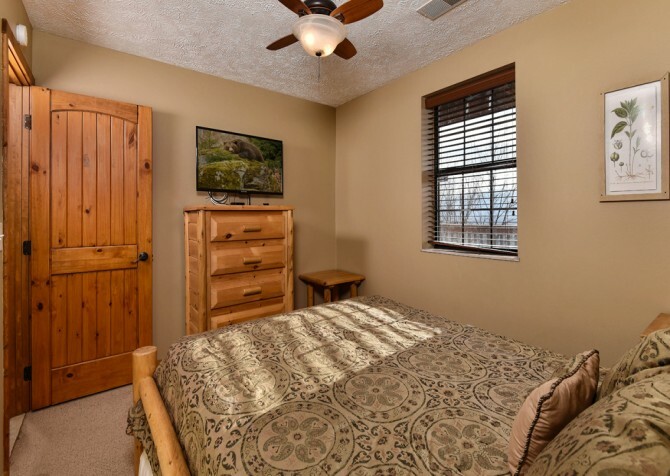 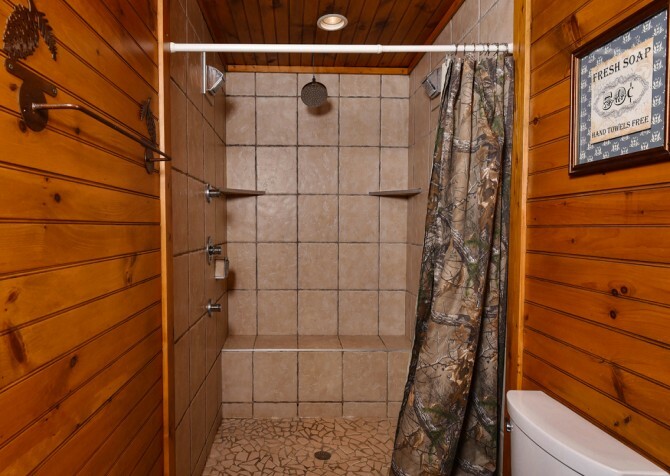 As a bonus, both bedrooms are located only a few steps down the hall from their own bathroom — each complete with a walk-in shower for a muscle-relaxing steam after a midday hike and a large vanity to help you ready for a night on the town! After a slight uphill walk on the flat, paved driveway (4-wheel drive recommended), it’s a mere 5 steps into the mountain cabin. 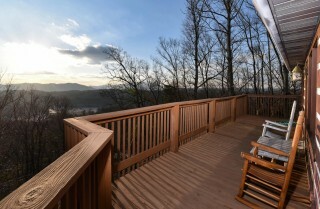 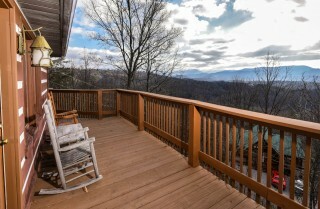 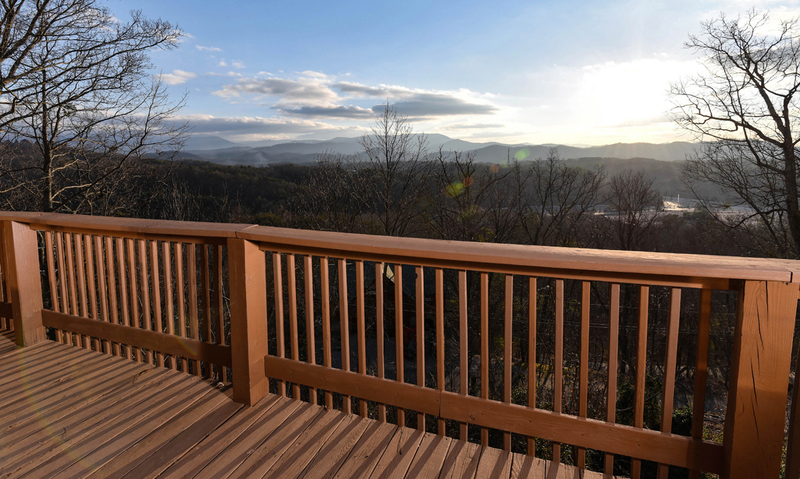 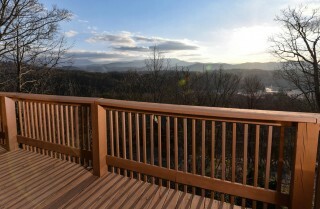 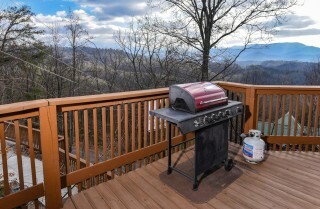 Head through the living space onto the entry-level deck to view the Smokies from the comfort of the his-and-her rocking chairs. 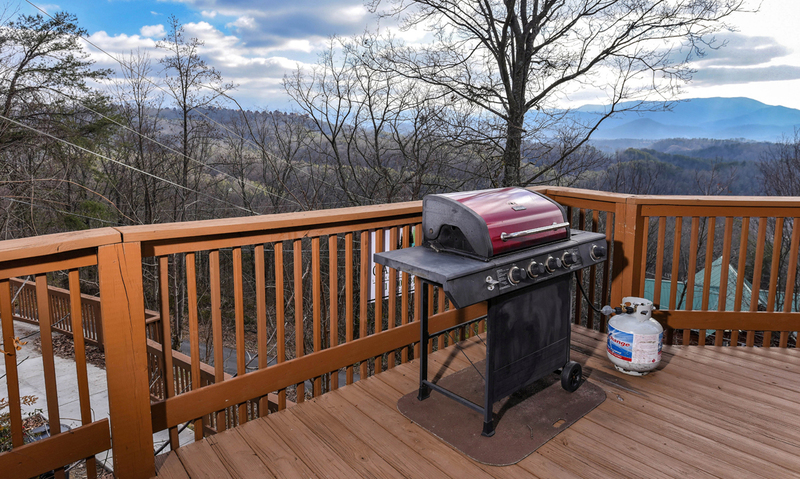 In the evening, host a barbecue shindig with the propane grill and lay out an array of salty and sweet snacks on the quaint wooden table. 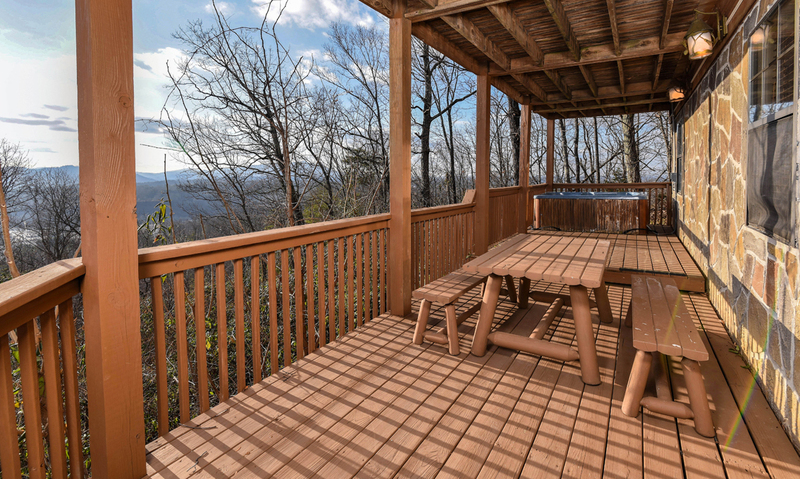 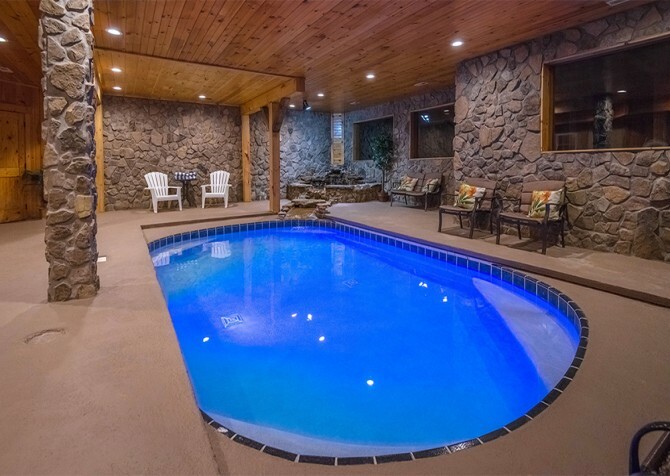 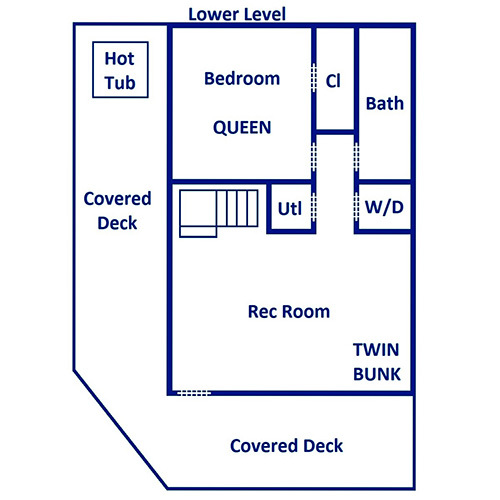 Afterwards, venture to the lower-level deck for a night soak in the outdoor hot tub. 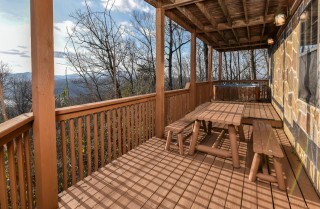 In the morning, enjoy breakfast outdoors at the picnic table while taking in the radiant mountain views. 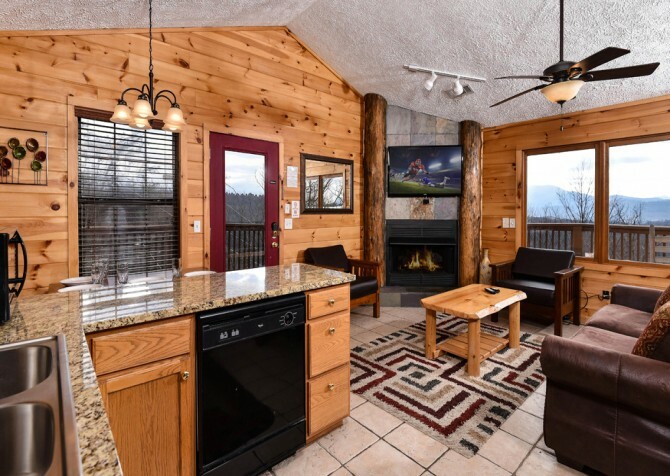 Next on this long list of amenities is the stackable washer and dryer (on the lower level), leaving room for Smoky Mountain mementos in your suitcases. 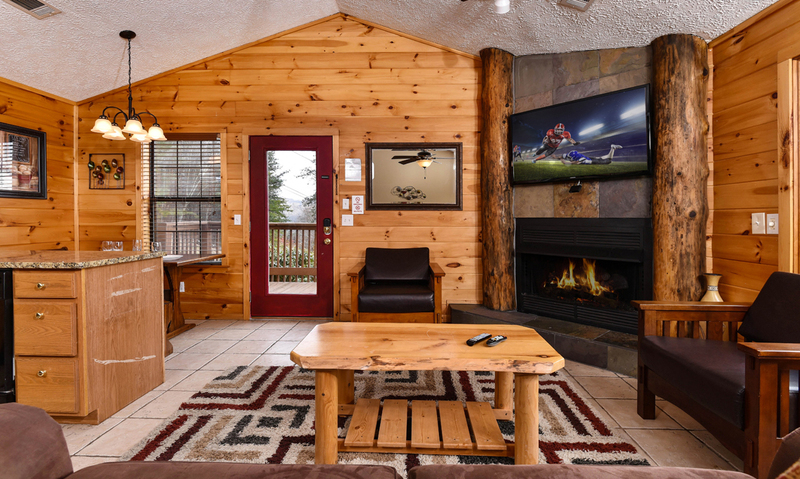 Perhaps the most important modern amenity of all, high-speed internet is also provided, allowing you to stay on top of emails, social media, and more. 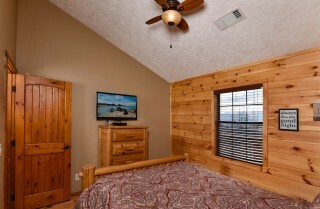 You can even bring along your favorite movies to pop in the Blu-ray player for a great movie night! With a location so close to town, Smoky View on the Rocks gives you easy access to the best downtown attractions. From dinner shows and amusement parks to golf courses and go-karts, entertainment is just around the corner! 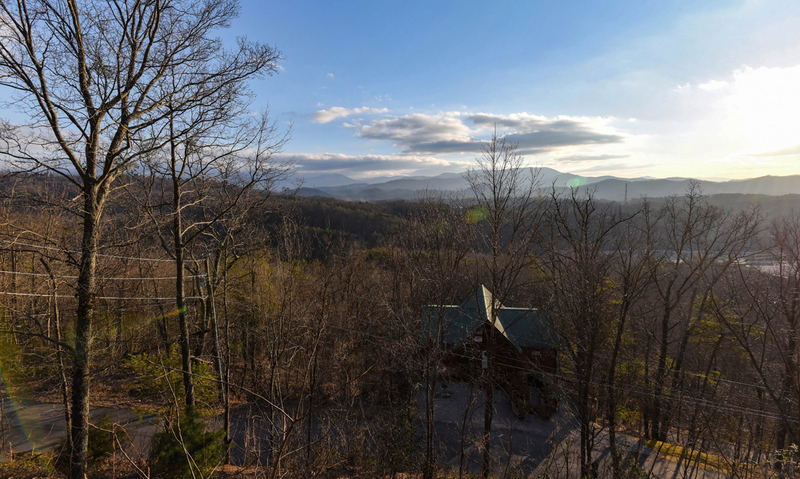 Walk through the enchanted landscape and explore the secret garden at Parrot Mountain and Gardens — only minutes away! 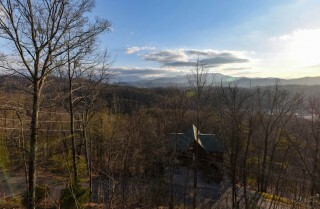 Swing a hole-in-one and some double bogies at the Gatlinburg Golf Course, lined with Smoky Mountain views for miles. 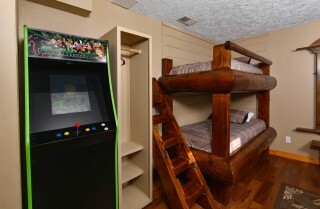 Go-karts all around, an amazing arcade inside, bumper boats for the courageous of heart, and mini-golf for the whole family — a great time awaits at The Track in Pigeon Forge!